Chief town of the department of the Loire-Inférieure, France. According to Camille Mellinet ("La Commune et la Milice de Nantes," i. 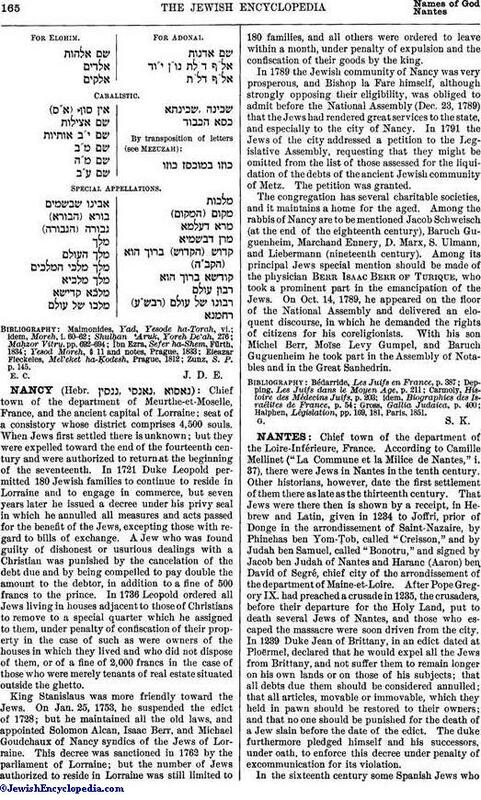 37), there were Jews in Nantes in the tenth century. Other historians, however, date the first settlement of them there as late as the thirteenth century. 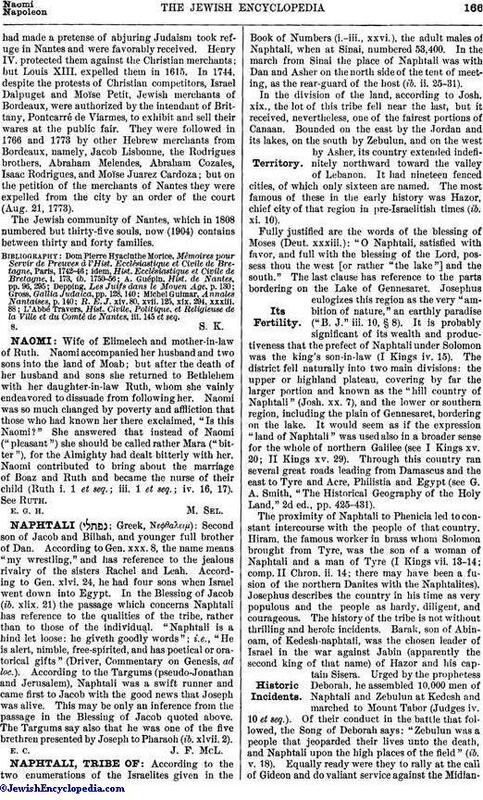 That Jews were there then is shown by a receipt, in Hebrew and Latin, given in 1234 to Joffri, prior of Donge in the arrondissement of Saint-Nazaire, by Phinehas ben Yom-Ṭob, called "Creisson," and by Judah ben Samuel, called "Bonotru," and signed by Jacob ben Judah of Nantes and Haranc (Aaron) ben David of Segré, chief city of the arrondissement of the department of Maine-et-Loire. After Pope Gregory IX. had preached a crusade in 1235, the crusaders, before their departure for the Holy Land, put to death several Jews of Nantes, and those who escaped the massacre were soon driven from the city. In 1239 Duke Jean of Brittany, in an edict dated at Ploërmel, declared that he would expel all the Jews from Brittany, and not suffer them to remain longer on his own lands or on those of his subjects; that all debts due them should be considered annulled; that all articles, movable or immovable, which they held in pawn should be restored to their owners; and that no one should be punished for the death of a Jew slain before the date of the edict. The duke furthermore pledged himself and his successors, under oath, to enforce this decree under penalty of excommunication for its violation. In the sixteenth century some Spanish Jews whohad made a pretense of abjuring Judaism took refuge in Nantes and were favorably received. Henry IV. protected them against the Christian merchants; but Louis XIII. expelled them in 1615. In 1744, despite the protests of Christian competitors, Israel Dalpuget and Moïse Petit, Jewish merchants of Bordeaux, were authorized by the intendant of Brittany, Pontcarré de Viarmes, to exhibit and sell their wares at the public fair. They were followed in 1766 and 1773 by other Hebrew merchants from Bordeaux, namely, Jacob Lisbonne, the Rodrigues brothers, Abraham Melendes, Abraham Cozales, Isaac Rodrigues, and Moïse Juarez Cardoza; but on the petition of the merchants of Nantes they were expelled from the city by an order of the court (Aug. 21, 1773). The Jewish community of Nantes, which in 1808 numbered but thirty-five souls, now (1904) contains between thirty and forty families. L'Abbé Travers, Hist. Civile, Politique, et Religieuse de la Ville et du Comté de Nantes, iii. 145 et seq.